I first had contact with The Zutons via a Levi's commercial that used their song, "Pressure Point," which is featured on this sire, here. Ever since the idea for this site has existed in my head, I listen vigilantly for cowbell in music. I think my ears are actually tuned to it. As soon as I hear anything that could be cowbell in a song, I listen intently. If I am unable to identify it right away, I make sure to write some of the lyrics down and find the song later. In this case, at the end of the commercial it actually said that it was The Zutons. After seeking their album out, I discovered that The Zutons are quite fond of the cowbell, plus the songs were really cool and different than your everyday crap on the radio. Indie rock splashed with saxophone from a full-time female saxophonist. I suppose that's why you can only get the albums via import from England nowadays. 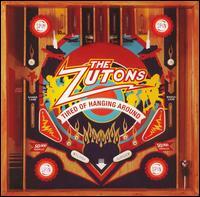 This track comes from The Zutons second album, it is such a great song. Catchy as hell, it has been their biggest hit up to this point. The cowbell is of the twinkling variety. It is used to flavor various parts of the song. I actually really like the Amy Winehouse-related cover versions a little better. They're more uptempo and it's in the same style of Winehouse's stellar breakthrough album, Back to Black, which was produced by Mark Ronson. The video below is the Ronson version featuring Amy on vocals. Winehouse also covered the song live by herself, without Ronson, hence the solo listing in the covered section down below.